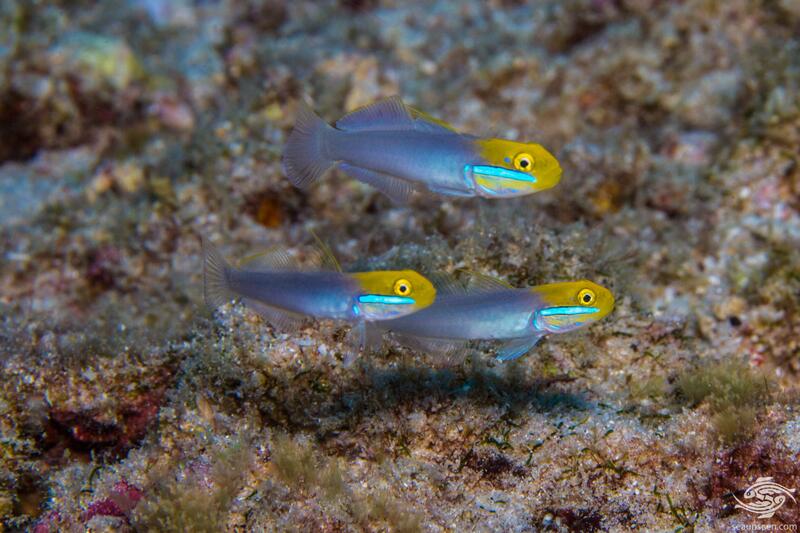 The Bluestreak Goby (Valenciennea strigata) is also known as the Pennant Glider, Blueband Goby, Blueband Glider Goby and the Golden-head sleeper goby. 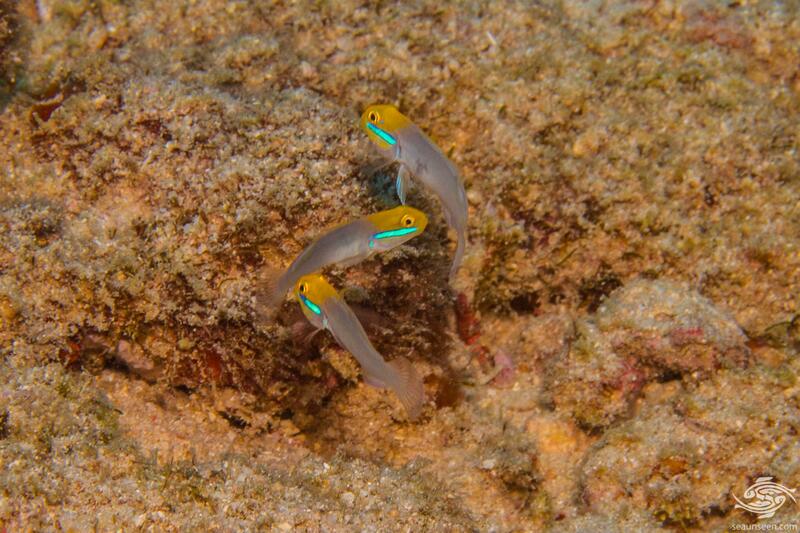 They lack the sucker type pelvic fins common to many other gobies. 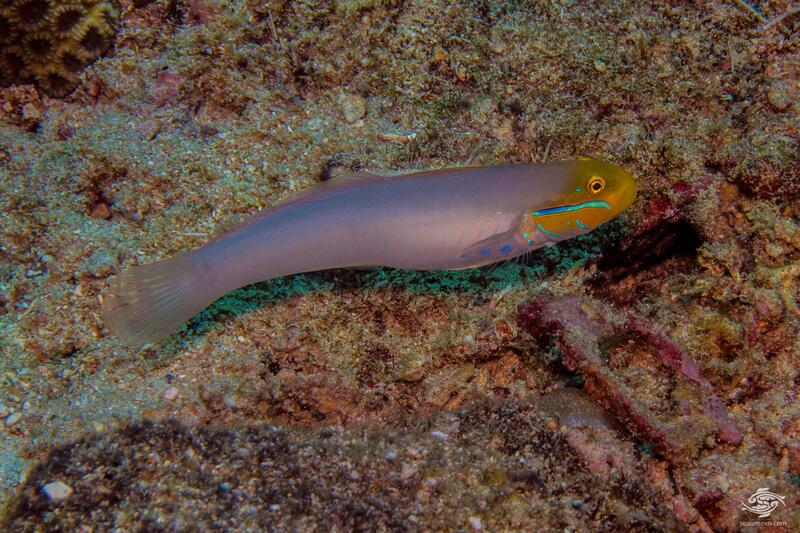 Technically sleeper gobies are in the Eleotridae family and Gliders are in the Valenciennea family so the common names are slightly confusing. 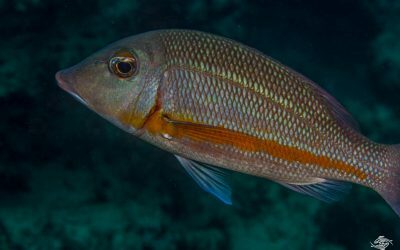 Technically however they are Gliders and obtain their name from their habit of sitting motionless in the water table above the substrate. 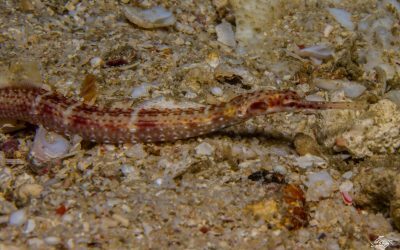 Both Sleeper Gobies or Sifter Gobies as they are sometimes known and Gliders take mouthfuls of sand and sift micro organisms out the sand. 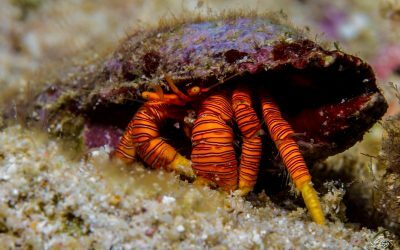 They both dig a burrow into the substrate and sleep in the burrow at night and use the burrow as a refuge during the day to avoid dangers. 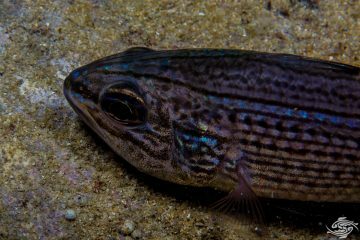 The Bluestreak Goby has an elongated cylindrical body shape with two dorsal fins typical of the sleeper gobies. The rear of the body is a whitish colour with a blue sheen to it depending on the angle of view. From the rear of the gill plates forward the colour changes to a bright golden yellow. 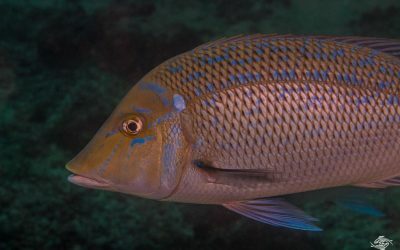 Below the eye there is a distinctive irridescent light blue streak running across the face which gives them one of their common names. Varying from specimen to specimen there are usually one or two smaller blue lines or spots both on the yellow and further back just behind the yellow. 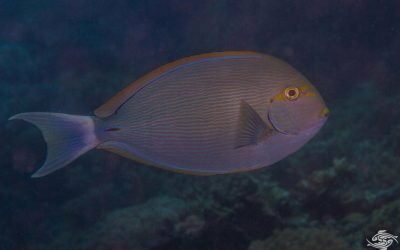 On the top of the first dorsal fin there is sometimes a yellow line. They can grow up to 18cm in the wild but 10 to 12 cm seems more common. 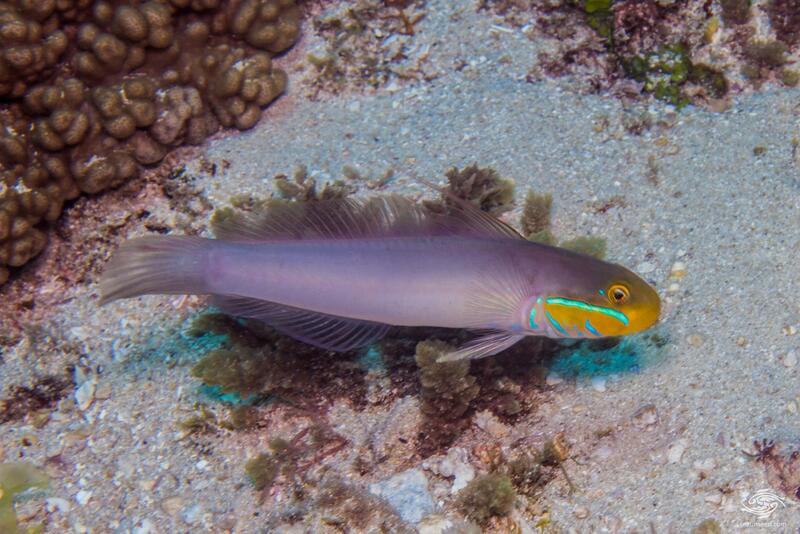 The Bluestreak Goby is fairly common in Tanzanian coastal waters. 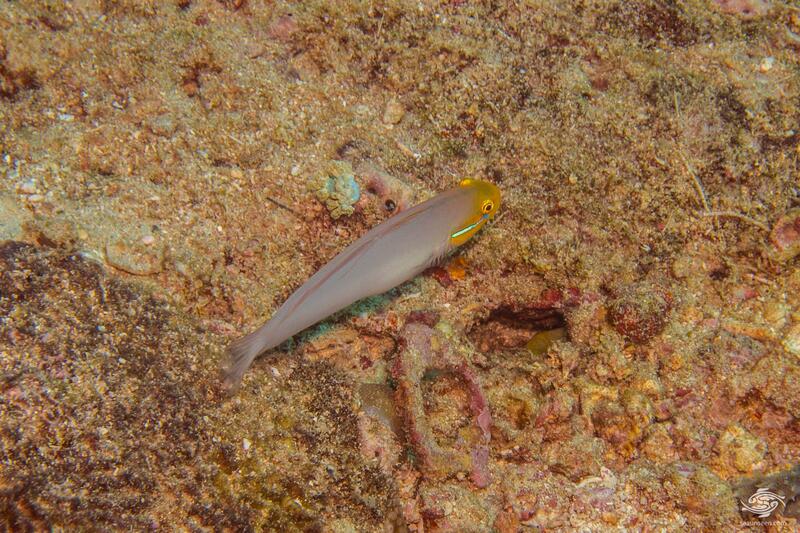 They are usually seen either swimming just above the substrate in pairs or sitting on the substrate near their burrow. Occasionally the pairs split up for a few minutes and then rejoin again. When threatened they head for their burrow and are quick to disappear down the burrow ascan be seen in the image below. At night they go into their burrow and usually seal it from within only emerging again in the morning once it is fully light. Typically monogamous pairs are formed and the pair defend both each other against potential mates and their territory which generally incudes several burrows. 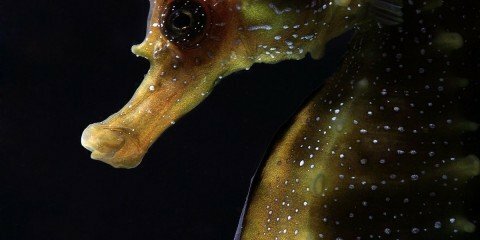 Both sexes prefer larger mates and will transfer to a larger partner if one comes along. 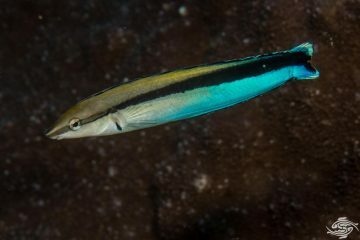 The Bluestreak Goby is found across the Indo west Pacific area from East Africa to southern Japan and south to the Great Barrier Reef including Lord Howe Island. 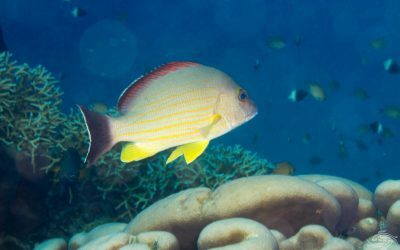 They are mainly seen on the rubble and sandy areas between corals and generally swim low close to the bottom. 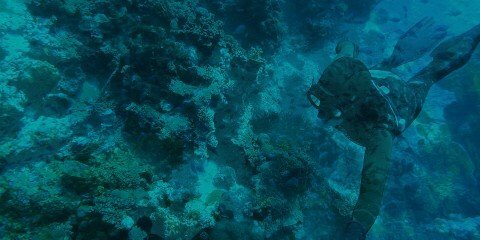 The juveniles at the 2 to 4 mm stage congregate in large shoals on rubble areas of shallow protected reefs. 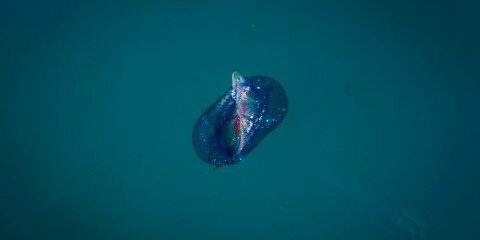 As they reach approximately 1.5 cm so they spread out. 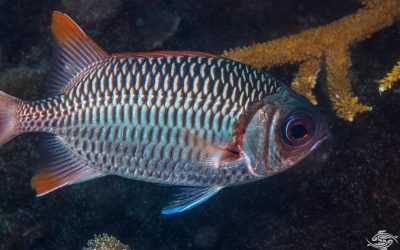 The larger fish of some 3 to 4 cm as seen bellow are seen swimming in small groups mainly over mixed rubble- sandy areas and seem to pair off at about this stage. 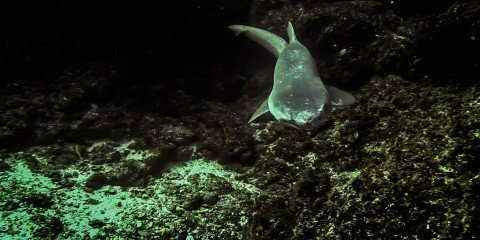 They are more common from 5 meters to 12 meters in depth but we have seen them down to 18 meters. 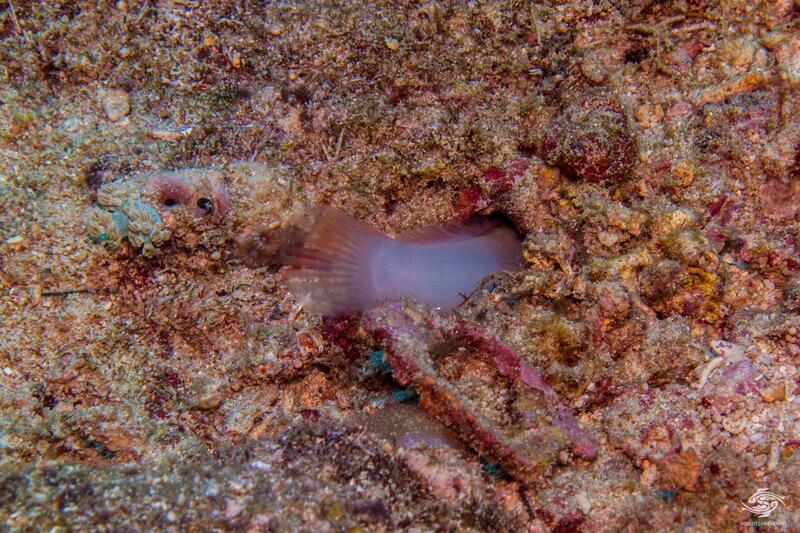 The Bluestreak Goby feed on small microorganisms that live in the sand. They take in mouth fills of sand and filter the microorganisms out the sand. 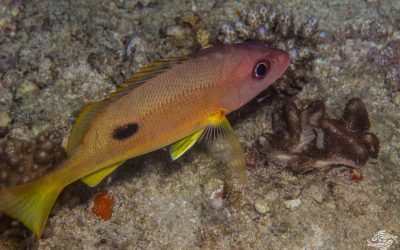 They form monogamous pairs and the eggs are laid in the burrow and cared for by the male. When the eggs are ready to hatch the male seals the burrow and then re opens it at night giving the fry a chance to disperse. 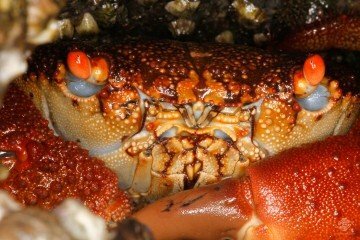 Females spawn every 13 days throughout the year and males care for the eggs for 1 to 4 days. 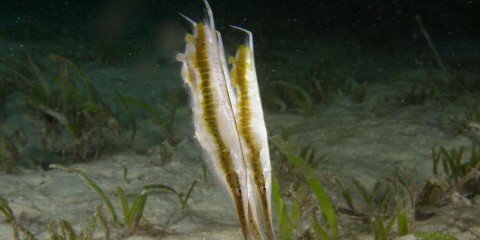 There is an interesting piece of research done on this species breeding habits here. Essentially males mate with the largest female that is available and will transfer from a smaller female to a larger if one is available. Females guard larger males and benefit from having a larger male who provides larger and more burrows which provide more shelter. 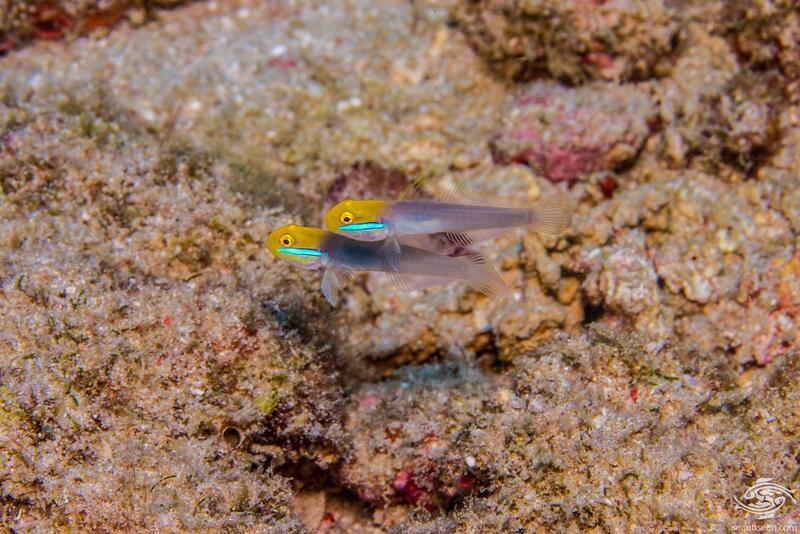 Bluestreak Goby make an interesting and useful contribution to a tank. 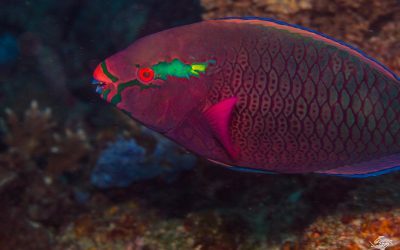 Although their personality varies from specimen to specimen , provided that they are in a sufficiently large tank with deep fine sand and good water conditions and no other aggressive species they are likely to be quite active. 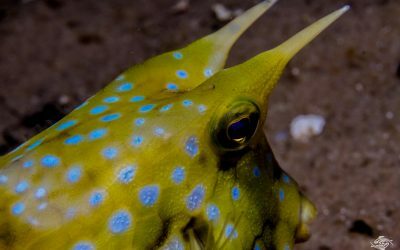 They have a lot of character and are intelligent fish. 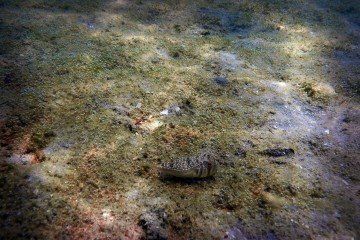 By constantly turning over the sand and oxygenating it they perform a useful function in ones tank. 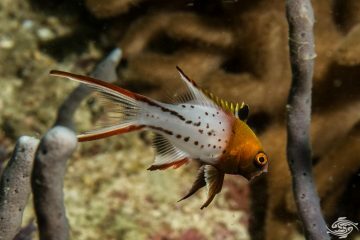 They tend to be easy to feed and are considered reef safe but may dump sand on invertebrates on the lower parts of the tanks. 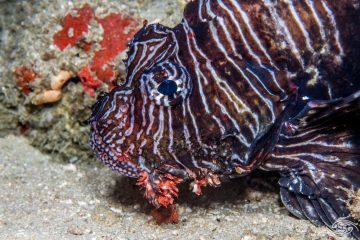 Provided one has the correct environment for them with mature live sand, they are easy to keep and may spawn regularly if one has a mated pair. Because of their bottom feeding habits they may have parasites and it is a good idea to deworm them. Unless one has a very large aquarium only one should be kept unless one has a mated pair. They will become territorial with other similar feeders who potentially threaten their food supply.